This course offers a sound education in all aspects of information technology and develops the diverse skills necessary for a career in computer games development. Graduates gain an enhanced work-ready expertise in games development, iterative design processes, team project planning and management, and games-specific technology. In doing so, graduates are equipped with a wide range of skills that can be applied to a range of IT careers, such as practical problem-solving skills, the application of theory and cutting-edge research to a real-world context, programming across a variety of languages, professional verbal and written communication, entrepreneurship, life-long learning, and an awareness of the principles of ethics in the IT sector. be proactive and reflective learners in relation to knowledge, skills, experience and career direction. Career options include computer game developer, data analyst, game/interaction designer, generalist programmer, graphics engine specialist, IT project manager, network specialist, software engineer, web developer. Current school leavers are advised to complete the Year 12 Engineering and IT Questionnaire. The questionnaire allows applicants to demonstrate their strong motivation to study engineering or IT at UTS and may assist applicants whose ATAR falls short of the required cut-off by up to three points. Non-current school leavers are advised to complete the employment question on their UAC application as adjustment factors may be applied on the basis of relevant work experience. The course can be completed in three years of full-time or six years of part-time study. 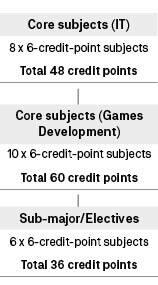 Students are required to complete 144 credit points, comprising IT core (48 credit points), games development core (60 credit points), and electives (36 credit points). Industrial training is available as an additional year by concurrently enrolling in the Diploma in Information Technology Professional Practice (C20056). The diploma comprises a minimum of nine months' full-time paid work experience and supporting subjects at UTS. The program below shows a suggested sequence of subjects for a full-time student. It is intended as a guide only and does not take into account such factors as recognition of prior learning, changes in attendance mode and subject availability, or satisfactory academic progress. Students should consult the Timetable Planner to confirm the availability of subjects in the current academic year. The Bachelor of Science in Games Development may be awarded with distinction, credit or pass. Students interested in research and who excel in their studies are eligible to undertake one additional full-time year of study in the Bachelor of Science (Honours) in Information Technology (C09019). The honours year is also available on a part-time basis over two years.